I didn't do as much gift-making this year as I have in years past because, honestly, the Christmas spirit is missing around here. A bit of a story that leads into what I did make... The Thursday before Thanksgiving we got the news that Eric's best friend since middle school had died suddenly. It was quite a blow. His kids all came to spend time with their dad because they knew how upset he would be. 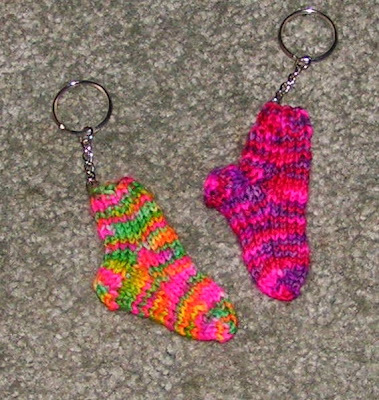 He very much enjoyed the company, of course, and while they were here both girls asked if I would make them socks. I agreed to because they were so good with their dad when he needed them most. The yarn for Meg's socks was easy to decide on, thank goodness. 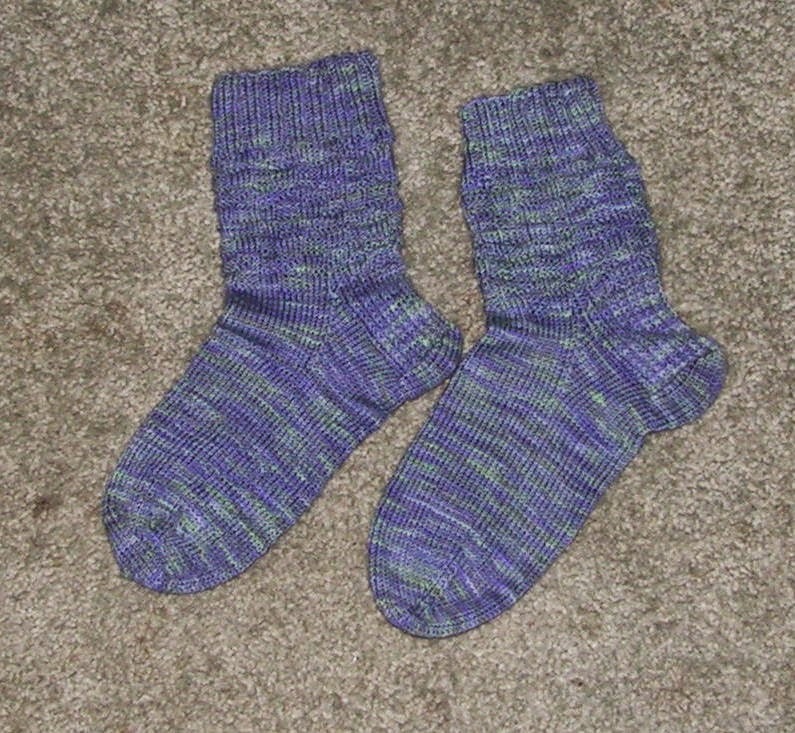 The yarn was a gift from a House Cup friend a few years ago - it was waiting in the stash for the right project. I love how it knit up! The colors are beautiful together. 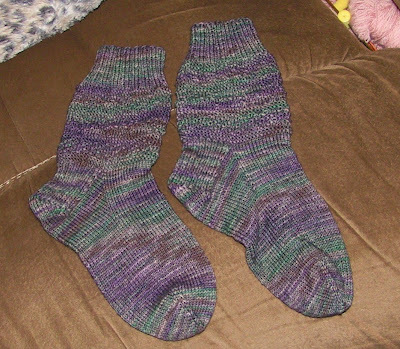 Erica's socks took a bit longer - nothing jumped out at me. I finally came across a skein that I'd dyed a while ago. 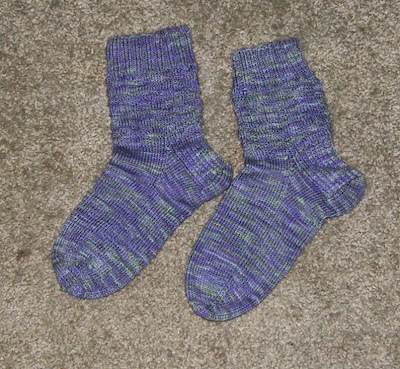 It took a bit longer to knit these, too, because I couldn't believe how nice the yarn looked. My final handmade gift is a bit different. They will hold lip balms and are for my brother's girlfriend's daughters. I don't know the girls very well, unfortunately, but they are both very sweet. I hope their mom doesn't mind them having glossy lips! I finally got around to putting our tree up yesterday. I then discovered that the box of ornaments, a big Rubbermaid tub, had gotten a lot of water in it when the basement flooded. I spent the afternoon throwing away so many ruined decorations. Worse yet, my star has disappeared. I made it thirteen years ago when the kids and I began our life without their dad. It was beautiful - cardboard, glue, and all of the glitters that I'd collected when I worked at the craft store. I'm heartbroken that we don't have it any more. I don't even want to decorate the tree now - it's in the corner in all its prelit glory, naked. Come January or so I'll start collecting glitter again to make a new star. It won't be the same, of course, but maybe this time I'll go with a silver, iridescent, and soft blue color scheme. Okay, enough with the down stuff! I have socks to wrap in the shiny purple paper that I had to get. (All of our paper was destroyed, too, so I got new rolls last week.) Tomorrow is the last day of school before Christmas break. Know what that means? Sleeping in! And probably rereading The Blood of Olympus - I love Rick Riordan's books so much. Did you know that his next series is Norse gods and mythology? So excited! So, tell me about your holiday plans and favorite books and crafts and stuff. I'll be back soon! Love the socks! I was going to reply somewhere, but I'm behind in my social media. You knit great. I tried knitting, but just couldn't get it. So I'll just crochet, which I love and works just as good for me. I'm deeply sorry to hear about your husband's friend's passing. What a challenging blow at anytime of the year, but especially during the holidays. It's no wonder at all that your household isn't in an overly festive mood. I hope though that despite this dark cloud, there will be moments of festive joy for you and that the New Year will usher in a sense of peace and joy to your family again. I'm always blown away by people who can knit! I don't get it!